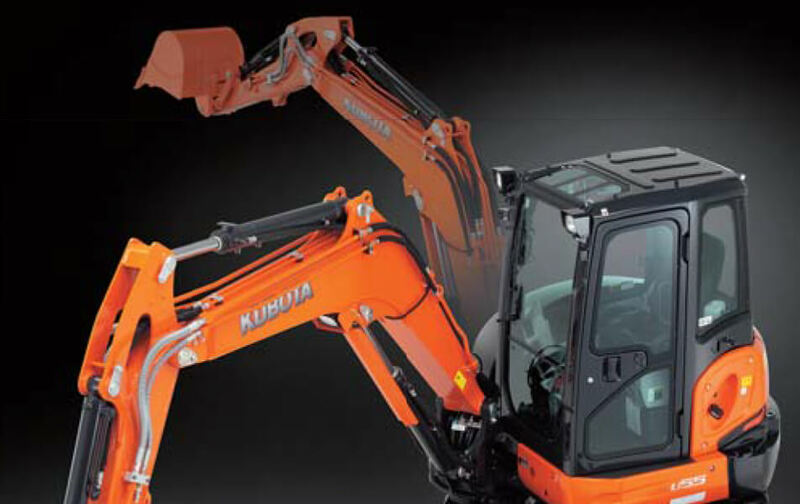 The Kubota U55-4 sets a new benchmark in the 5.5 tonne excavator class with outstanding power, versatility and confined space operating capability. Daily inspections can be performed effortlessly with wide opening rear and side hoods, allowing easy access to vital components and high on safety with a refueling signal button and a negative travel brake that takes the worry out of transportation. Fast Facts: Working Range – Maximum digging height 5665mm, maximum digging depth 3630mm, maximum dumping height 4005mm, maximum digging radius up to 6105mm, turning radius w/o swing 2460mm, tail turning radius 1045mm. Specifications: Length-5500mm Width-1960mm Height-2550mm Ground clearance 391mm (min). Dependable: Engineered with the power to maximize digging and lifting performance, it also delivers minimized noise, vibration and fuel consumption. Maximum digging depth: 3630mm with a vertical digging depth of 2830mm. 5.5 tonne excavator class with outstanding power, versatility and confined space operating capability.